One of the most useful features Apple has added in iOS 7 is the ability for users to block any number or Apple ID from contacting them. 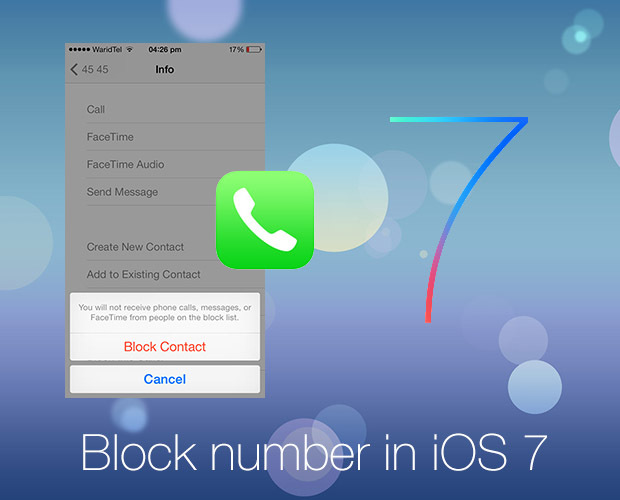 On their iOS 7 running iPhone, iPad or iPod touch they can simply block any contact or unknown number from sending them messages, calling or video calling through Facetime. Using this feature to block anyone is very simple and in this post we will explain how you can do it in a few simple steps. Let’s get started. Remember that iOS 7 allows users to block any number from different stock applications so if you receieve a message you can block that number from the Messages app, if you receive unwanted calls you can block a number from Phone app and finally if you receive a video call from an unwanted person then you can block it from the Facetime app. If you block any number the change will have affect across the board and the blocked person will not be able to contact you in any way on your iOS device. 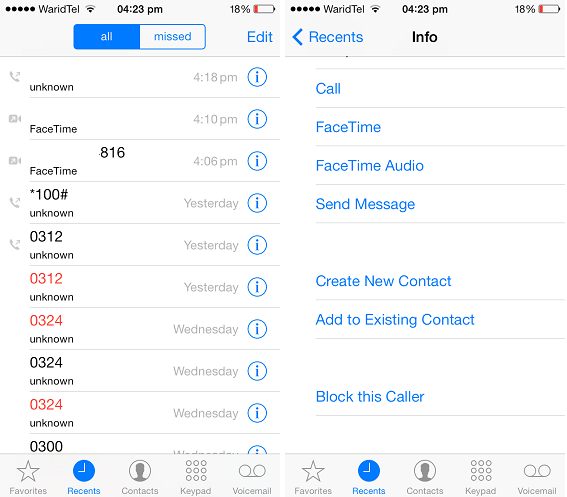 There are two ways to block a caller through Phone app of iOS 7. First is through the ‘Recent’ tab. 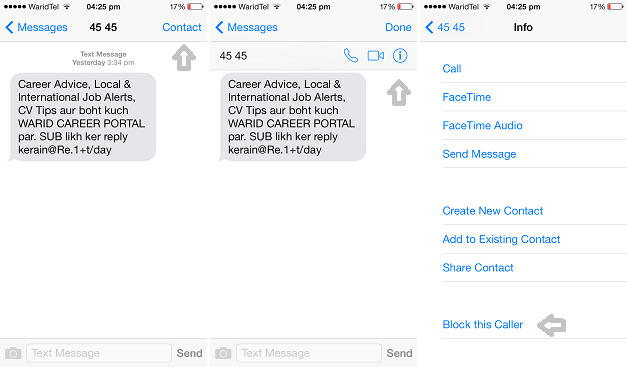 This way is useful for blocking numbers that are not in your contacts list. This can be any random caller that is annoying you or any marketing company that keeps bothering you to buy their products. In order to block any number simply tap on the ‘Recent’ tab from the nav bar and then tap on the ‘i’ button that has circle around it. Now on the ‘Info’ page scroll down and tap on ‘Block this Caller’ option and then confirm. The other way is for blocking any number or email address that is in your contacts list. To do so tap on the ‘Contacts’ tab and then look for the person you want to block. Tap on his or her name and then scroll down on the next page. There you will also find the ‘Block this Caller’ option, tap on it and confirm. Next up we will show you how you can block any number that is sending you annoying text messages. From the Messages screen tap on the thread of number you want to block. Then from the top right side of the screen tap on the ‘Contact’ option. Now a bar will appear with different options. Tap on the ‘i’ button that has circle around it. From the next page tap on the ‘Block this Caller’ option. That’s it. Receiving Facetime calls from people you don’t want to talk to? Don’t worry iOS 7 has got you covered. In order to block any number or Apple ID from contacting you simply launch the Facetime app and go to the ‘Recent’ tab. From there tap on the number or email ID you want to block and then from the next page tap on the ‘Block this Caller’ option. 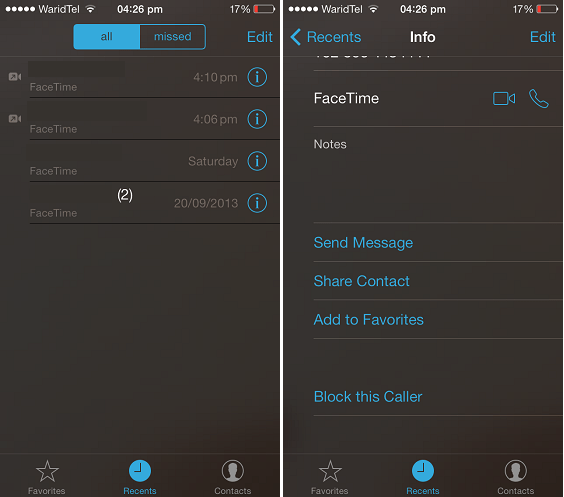 You can also block a contact from calling you from the Facetime app in the same way. Again, remember that when you block any number the change is reflected in all other apps so if you have blocked someone from messaging you the same number or email address won’t be able to Facetime or call you on your number.